There’s no understating the importance of ecommerce on today’s business landscape. It’s either allow your customers to shop from their pajamas, or watch your sales tank. But getting your company’s website ecommerce-ready is no walk in the park. The top solutions available today are more reserved for larger businesses both in terms of cost and functionality – while those that are more affordable offer little integration flexibility and too few features. 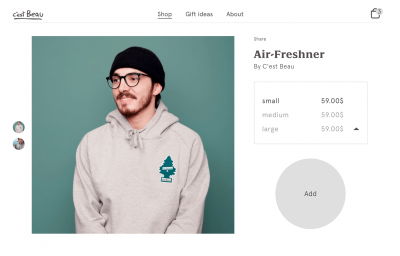 Of course, you could always turn to an online retail giant like Amazon or Etsy to peddle your goods – but separating from your site in this manner is inconvenient for shoppers and hurts branding. Not to mention how easy it is to get lost amongst the huge sea of competing sellers. Those who use Snipcart, however, don’t have these problems. It’s a 3rd party shopping cart platform professionally crafted with developers in mind – and able to be added to any existing site quickly and painlessly. And best of all, you don’t have to be a large national player with lots of zeros in your bank account to take advantage. Snipcart truly is the ideal shopping cart solution for any website – no matter what size business is behind it. Not just any size business, but any type and any ecommerce need, too. Regardless of how involved your sales process is, the software is flexible enough to support digital, physical, and subscription-based products – while also supporting discounting, multi-currency purchasing, and other special situations. From their Quebec City headquarters, the company is gaining quite the reputation around the business world since opening for business in 2014. To date, more than 6,500 developers have added ecommerce to their websites with Snipcart. Going forward, Snipcart’s leadership team will hone in on executing customer acquisition strategies that allow them to capture even more global market share. They will also continue taking every opportunity to evolve the technical end of the platform in accordance with consensus user needs. If you’d like to try Snipcart out for your business or would simply like more information, check them out online at www.snipcart.com.